Working collaboratively with colleagues, agencies and clients is essential to your organization’s success, but it’s rarely easy to do so. Ever tried sending an hour-long video or a collection of finished masters to people outside your team? Then you know what a pain it can be when they’re forced to purchase special software, or when a file takes hours to download or worst still, is found to be incompatible or corrupted. Even in companies with access to significant IT know-how and comprehensive network setups, the simple act of moving video files often reverts to the physical world. These manual activities eat up time and can be costly. Think of the evenings you’ve wasted saving video to hard drives and transferring content through couriers from one place to another only for your collaborator(s) to find the file unreadable or broken in transit. Too often, conventional media distribution workflows are fragmented, fraught with delays, labor intensive, and poorly equipped to meet the demands of disparate clients. All these challenges present real barriers to a content provider’s ability to innovate, collaborate, and bring new revenue streams to fruition. Using the cloud can offer you the opportunity to manipulate and distribute professional video more easily than any of the methods described previously. The cloud allows for simple sharing because all IT resources are consolidated in one place and accessed via the Internet lots of users can share and collaborate on the same infrastructure and content simultaneously. 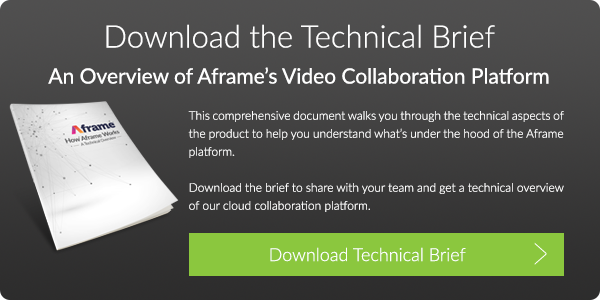 A purpose built solution such as Aframe can reduce technical complexity allowing for easier access and usage, saving businesses both time and money.